WOW! 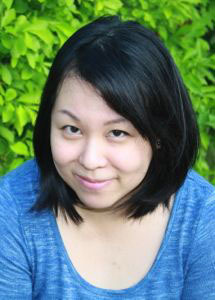 was honored to have guest judge, literary agent Jennifer Chen Tran choose the winter season’s top winners. Thank you, Jen, for sharing your time and efforts to make these contestants’ dreams come true! Jennifer Chen Tran is an agent at Bradford Literary, joining in September 2017. She represents both fiction and non-fiction. Originally from New York, Jennifer is a lifelong reader and experienced member of the publishing industry. 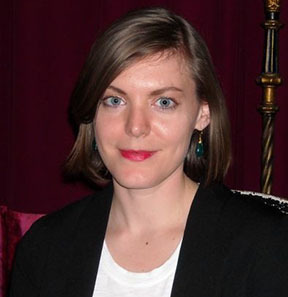 Prior to joining Bradford Literary, she was an Associate Agent at Fuse Literary and served as Counsel at The New Press. She obtained her Juris Doctor from Northeastern School of Law in Boston, MA, and a Bachelors of Arts in English Literature from Washington University in St. Louis. Courtney McDermott is a graduate of Mount Holyoke College and the MFA program at the University of Notre Dame. Her debut collection of short stories, How They Spend Their Sundays (Whitepoint Press 2013) was nominated for both the PEN/Hemingway Award and The Story Prize. Her short fiction has been twice nominated for a Pushcart Prize. Originally from Iowa, she currently lives in the greater Boston area. She works in the Film and Media Studies Program at Tufts University and teaches part-time in the online Master’s in English program at Southern New Hampshire University. Follow her on Twitter @courtmcdermott or find her on her website: www.courtneymcdermott.com. Long before I met her, I knew that she was out there. She was a stone skipping into a great wide lake, and I was the shore absorbing the tremors radiating from her presence. She made things happen, and then she happened to me. I met her along the Gulf of Mexico. She was sitting where the water kisses the sand. She held a seashell up to her ear. Her eyes were closed and she held her breath. She was the most curious woman I had ever seen. “Do you hear the ocean?” I asked. We sprinted off to St. Augustine. We wore shorts and walked barefoot in the sand. Fashion was for those who were uncertain about themselves, she told me. The man who married us wore a diving suit. After we ate our cake and took photos in the sunset, I drove her to the harbor. “Where are we going?” she asked, and I leaned over to whisper in her ear. “I’ve always wanted to go on a cruise!” She laughed, rolling down the window, letting the salty wind invade the car, blowing our hair. My therapist once told me that after two years, romantic passion dissipated to bittersweetness. I was madly in love with her past the two year mark. We worked out of the apartment in separate offices because she said, “We each need a room of our own.” But the walls were so thin we could still speak to one another at a normal volume. “Lunch,” she would say, just at that moment when I was feeling hungry. And that’s how it always was. One day she didn’t call out lunch. She went to the bathroom and when I was feeling hungry she still hadn’t returned. She coughed. I opened the door to see her kneeling over the toilet. Blood splattered on the toilet seat, on the floor, on her mouth. She laughed at cat videos. She whimpered when she killed a mosquito and it left blood on her skin. At winter’s first snowfall, she’d bake cookies for the neighbors. She sent homemade cards just because she was thinking of you. She adopted a manatee named Calvin and hung its photo on our fridge. When we went to karaoke (which I dreaded), she could get the whole bar singing. She saw everyone. Loved everyone. She saw me. She loved me. “This has been undiagnosed for so long…” the doctors said. I thought about not going in. About faking sick from the choking smell of Lysol in the hallway. But she would know if I walked away. The white of the hospital room scared me. She already looked like a corpse. Her cheeks dull like a doll’s, her breath so shallow that I couldn’t see the waves of her chest rising and falling. “Shh,” she whispered, but the silence drove me crazy. I brought her favorite books: Jane Eyre, The Bell Jar, Mrs. Dalloway. I read aloud to fill the silence. I read to her when I couldn’t think of words to say. I tried to make her laugh. I played cat video after cat video. Cats licking babies, cats falling off of chairs, cats dressed up like lobsters. I placed seashells by her bedside, but she didn’t notice. Tomorrow her sisters would arrive. Her nieces would crowd by the bed and her son from the unfortunate first marriage would stare at the floor. They’d push away the books and toss the seashells aside. They wouldn’t hear her laughter and she would listen only with her eyes closed. They would strive to remember the color of her eyes. What the hell were swish pants, Mia wondered, poring over the prison’s online dress code for visitors, and why did the jail forbid them? She hadn’t decided whether to visit him. His caseworker first called a week ago, as Mia shopped for paintbrushes. I’m looking for Felix Delgado’s daughter. It was Mia she sought. After Delgado’s travesty years ago, committed in Mia’s presence, a childless couple had adopted her, offering a fresh canvas for her future. With their love, the nightmare’s hard edges softened. “He’s dying, Maria,” said his caseworker. Back home, Mia’s father stood on their porch contemplating Mount Washington, her mother beside him, curled up in an Adirondack chair. “What did you decide?” her mother asked. “Right. Paintbrushes.” Sagging onto the porch steps, Mia offered her bag to her mother, who peeked inside before patting Mia’s hand. For days, Mia wrestled with Delgado’s request, imagining him stretched on a prison cot reading his bible. The model inmate even led a prayer group, his caseworker noted. Padre nuestro que estás en los cielos. Her birth mother’s plea had gone unanswered. Mia pressed her face against icy steel and squinted at the living mountain overlaid with an artist’s rendering of The Old Man. She strained to reconcile the disparate images, but Great Stone Face eluded her. Driving home, her father offered evidence the Old Man endured: his image etched on New Hampshire license plates, road signs, coins; literature inspired by his curt jaw. After their meal, Mia retreated to her studio. She attempted a still life, but her ragged strokes bore no resemblance to the tranquil fruit bowl before her. At the knock, Mia’s brush skidded across canvas, leaving a crimson gash. Afterward, Mia wondered why she hadn’t unburdened herself sooner. The next afternoon, under a spring sky bruised purple, father and daughter passed through security to a windowless room. When the door opened, Mia jumped, startled by the man in black. Stricken, Mia faced her father. “You should have let us know,” he chided the chaplain. “Is that so?” Mia’s father rose to leave. As Mia accepted the bible he offered, yellowed papers fluttered to the floor: the Serenity Prayer, a photo of Mia as a toddler, a motherly arm encircling her waist. She swallowed, then asked her father to detour. This time at the scenic overlook, Mia took her time, squinting hard into the viewfinder until her eyes burned, until the real and the imagined Old Man coalesced, exactly as her father had foreseen. Elizabeth Eidlitz is a retired independent school English teacher, a writing workshop facilitator, and newspaper columnist who recently became intrigued by the demands of flash fiction. She has coedited a textbook, published a few short stories and many feature articles. She is amazed at what writers have created with only 26 alphabet letters. In her own work she tries to define both factual and emotional truths. She loves E.B. White, animals, laughter, French onion soup with lots of melted cheese, and unvarnished people. She lives in Concord, Massachusetts. Mother calls this New York City shopping expedition “Our Day”—with lunch at her favorite Japanese restaurant if I’m not snippy. It’s her effort to try to like her child better by pretending closeness, hoping it might catch on. “Well the color’s nice, but it’s too sophisticated,” I say. The beautiful dress swings on the rack in diminishing blue arcs. We cross Fifth Avenue tandem. The back slash in Mother’s straight skirt moves like sharp scissors. My lie has embarrassed and divided them, leaving a thrilling dividend of doubt. Heading for the car, I avoid looking at mother. She pulls a hankie from her purse, blows her nose. Throat clearings, the metronome of windshield wipers, and jangling toll coins punctuate the silent drive home. Rejecting my mother in front of her friend was a terrible thing to do. My mind practices “I’m sorry,” yet my words, though true, never slide out easily like hers. I resolve to say them before the 79th Street boat basin, but Mother drives too fast. 96th street then. We pass Grant’s Tomb. What if she dies without knowing how sorry I am? The cloisters. It’s foolish to apologize. Mother’s stony face proves she doesn’t expect one. Probably wouldn’t even want it. I hunch into my soiled raincoat while the rearview mirror shrinks the span of the George Washington Bridge. Its lights, outlining connections across dark blue space, are fading to mere pinpricks. Congratulations to our Winter Contest Honorable Mentions! Your stories stood out and are excellent in every way. 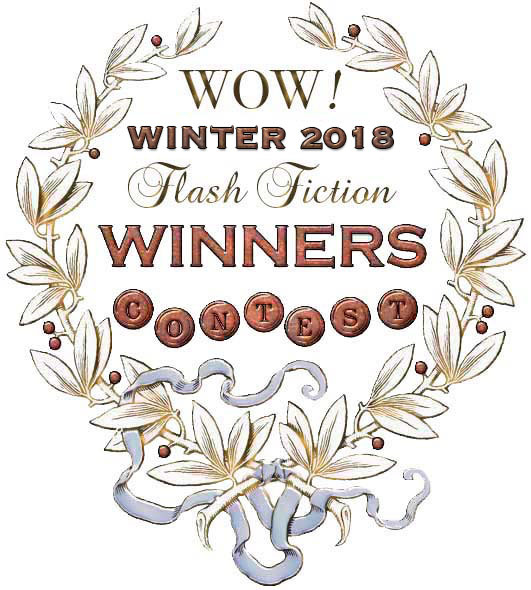 This brings the Winter 2018 Flash Fiction Contest officially to a close. Although we’re not able to send a special prize to every contestant, we will always give our heartfelt thanks for your participation and contribution, and for your part in making WOW! all that it can be. Each one of you has found the courage to enter, and that is a remarkable accomplishment in itself. We’re looking forward to receiving your entries for our next contest. Best of luck, and write on!